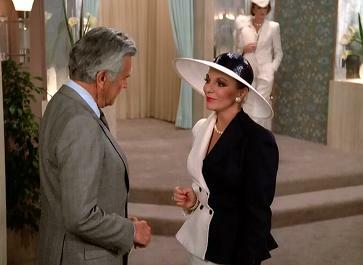 One of the issues with Dynasty is that the writers will just shift gears near the end of a season to prepare for the finale and the following season. You can totally see the shift in this episode. Michael is back and is now very concerned about his security. The prince is even upset that the people at La Mirage allowed his fiancee access to him. Horror of all horrors. Michael should be concerned about his security because there are people gunning for him. Too bad for him that his head of security is part of the conspiracy against him. The conspirators first plot at a nightclub was foiled when Michael and Amanda decide not to go. The second plot works for a couple of minutes. These goons manage to kidnap Amanda. For some reason as the car with Amanda speeds off (with Dex giving chase) the goons in the backseat like to shake Amanda. I guess there is not much fun in Moldavia. Dex is able to save Amanda. The response is for Blake to have a new conference back at the mansion. Yeah, I don't get that either. After the news conference, Blake insists that Amanda marry Michael in Denver where she will be safer. Ummm, wasn't Amanda kidnapped in Denver? It does not matter, Amanda has the final say, and she is to marry Michael, as scheduled in Moldavia. Amanda leaves for Moldavia to prepare for her wedding in a couple of weeks. Guess who Steven is taking to the wedding? Luke. I guess that is a great consolation prize for Luke since Steven tells him that he is not ready to commit to him and move in together. Luke calls Steven out for being able to commit to everybody but another man. Despite Steven moving forward with Luke, Adam still feels threatened by Steven who Adam believes still has interest in Claudia. Adam threatens Steven to stay away from Claudia. Now, that is going to be kind of hard since they are family. If you feel threatened by your younger, gay brother taking your woman, then maybe you should not pursue your gay brother's ex-wife. Just some smart advice. Don't you remember that Alexis and Dominique were supposed to spar and that the two of them, along with Blake, inherited a large estate from Tom Carrington? The writers had forgotten for a while. Just because she can, Alexis "forgot" to put Dominique on the guest list for Amanda's wedding. And, just because he can, Blake had to tell Alexis about it himself. Alexis is more than gracious in fixing the over-sight. 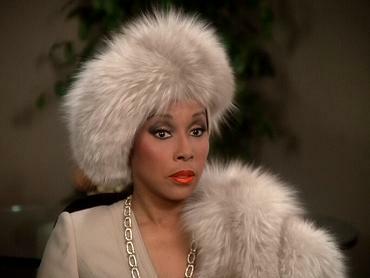 Additionally, Alexis is determined to make Dominique's handling of Tom's Estate as difficult as possible. Dominique finally got an excellent offer to sell the timberland in Sumatra, but Alexis refuses to agree. Dominique only has one recourse, that is to take Alexis to court. Let's play nice until after the wedding! Daniel Reese's luck finally ran out, as Dex receives a cable notifying him that Daniel died on his latest mission. What? We don't get to see the death or make it dramatic. We just get a cable. True, Rock Hudson was becoming increasingly ill and had a hard time with his lines, but Ali MacGraw has a hard time acting and they have no problem giving her screen time. Dominique is tired of Alexis's pseudo condescension. Speaking of Ali MacGraw, Lady Ashley tells Jeff that she cannot move forward with him as long as Jeff is still searching for Fallon in his heart. Jeff shows the picture to Alexis, and Alexis tells Jeff that he needs to move on and accept that Fallon is dead. It is only when L.B. says something to Jeff that Jeff realizes that even if Fallon is alive, that he cannot go chasing her. Fallon will have to come back to him and their family. Fallon may have a hard time doing that because there she is sitting in a police station in Los Angeles and is unable to tell the police what her name is. She may also explain where she got the British accent from too. Alexis: Unlike your talent, Dominique, timber is a resource presently increasing in value. I wonder if that rug was part of the Dynasty collection!